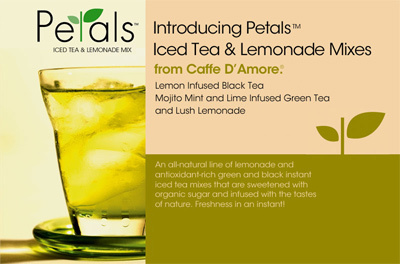 Caffe D'Amore Petals powdered mixes offer an easy and all-natural line of instant drink mixes! These Lemonade and antioxidant-rich green and black iced tea mixes are sweetened with organic sugar and infused with the tastes of nature. Fresh flavors in an instant in this 2.5 lb. bulk bag! Lush Lemonade has been discontinued, and remaining quantities are limited and final. As an alternative option, try DaVinci's Lemonade Concentrate from their Fruit Innovations line.